The staff at the veterinary hospital braced themselves behind the desk. Across the lobby they watched as a couple scrutinized the invoice’s contents for their dog’s medical treatment. Their dog, who had been diagnosed with renal cancer, had just undergone a successful yet grueling surgical procedure to remove her cancerous kidney, and part of her adrenal gland. She was still in recovery, under close watch. The office manager was prepared to explain the bill, but Dr. Nick Bacon, the surgical oncologist, walked towards Lisa and Harry Posin instead. As Harry pointed to the bill, he remarked, “Dr. Bacon, I think there must be some mistake with the bill.” So Dr. Bacon graciously began the task of going over each item on the bill, line by line. Afterwards, Harry pressed on, “But doctor, the bill is too low. Is your fee in here? Dr. Bacon exhaled. Suddenly, the weariness from the surgery washed away, as he assured Harry that indeed his fee was part of the bill. Thus began a warm and mutually rewarding relationship between Dr. Bacon, the Posins, Olive, their beloved Maltese, and the University of Florida College of Veterinary Medicine. 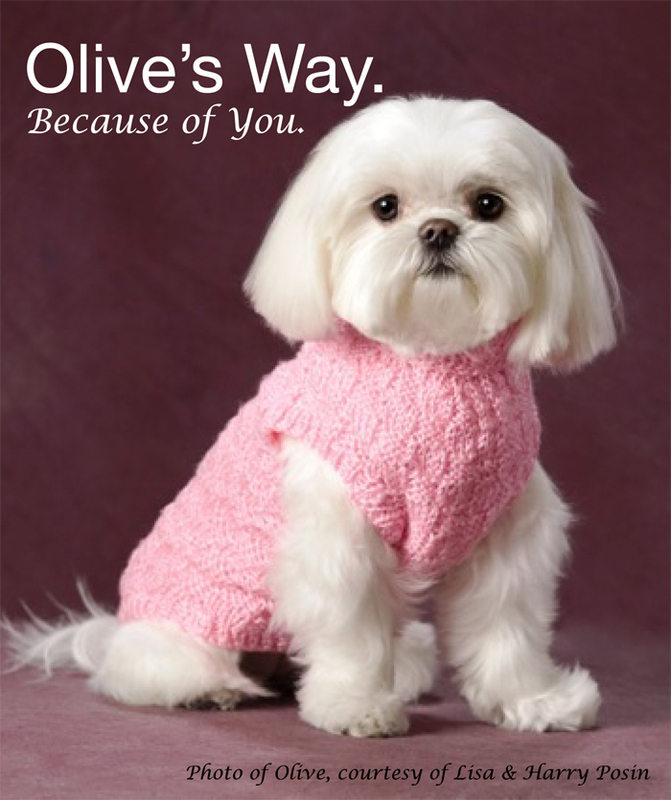 Olive, during her promotional photo shoot for Olive’s Way. “Olive has cancer,” Harry told Lisa. “We’ll get her the best treatment available,” he assured her. The Posins immediately took Olive to a specialty hospital in Coral Springs to see Dr. Morales. From what she had been told by Marie’s veterinarian, Dr. Morales initially thought to herself that there was little hope for Olive. She would make sure Olive was comfortable until the Posins were ready to let her go. While Lisa, her mom and Olive traveled to Gainesville by plane that same afternoon, Dr. Morales was already on the phone with Dr. Nick Bacon, head of the Oncology Unit at the University of Florida College of Veterinary Medicine. Harry would fly up later that evening. What makes the UF College of Veterinary Medicine so special is the team approach taken with each patient to reach a diagnosis and recommend the subsequent care. For one consultation fee, the patient is seen by an entire team of specialists in one location. It is often a profound savings in cost, and certainly a savings in time, as all tests, procedures and specialists are contained on one campus. Once in the system, a family is gently guided throughout the various processes by the team, while being provided thorough explanations and assurances along the way. Convinced that the bill was correct, but not completely satisfied, Harry asked Dr. Bacon, “How much money is raised each year for the oncology unit?” Surprisingly, on average, only $10,000 in donations came in sporadically each year by humans whose animals’ lives had been touched by the College of Veterinary Medicine. “They were making due with what they had,” said Lisa. The Posins, who had together already decided they would make a donation to the oncology unit for their efforts in having saved Olive’s life, decided that they also wanted to create a vehicle to raise even more money specifically for the Oncology Unit. Through this foundation, all of the money raised would go to help develop more research programs, purchase state-of-the-art equipment and fund in whole or part, an internship, a residency in medical oncology, and a fellowship in surgical oncology. The oncology service at the College of Veterinary Medicine has grown from a single clinician in 2002 to the largest training center for veterinary oncologists in the Southeastern United States. In 2010, the College of Veterinary Medicine at the University of Florida opened a new hospital with 100,000 square feet dedicated to the diagnosis and treatment of veterinary patients. Today, the University of Florida is one of only two centers in the world to train veterinarians in cancer surgery in a post-residency program. Olive’s Way has helped to make all of this possible. Olive defied the odds and lived another four years after her surgery. “They were four good years too,” said Lisa, who can still vividly recall the day it was time to let Olive go. “I was lying in bed with her face on my face. Harry was looking at us with tears in his eyes, waiting to take her. That precise moment in time always comes back to me whenever I see anyone else in pain. I still miss her dearly, and telling her story allows me to get back in touch with her. I never want to lose sight of her, and I can be completely re-charged just by seeing a picture of her.” Dr. Bacon changed the Posin’s lives, and they changed his. As a result, he has changed the whole landscape of the oncology department at the University. “Even though cancer is such a horrible subject, we are on the hopeful side of it, thanks to Olive’s Way, and the Oncology Department at the University of Florida,” said Lisa. Author Anna CookePosted on January 31, 2013 Categories UncategorizedTags Cancer, Cancer in Dogs, College of Veterinary Medicine, Dog, Dog Magazine, Dr. Nick Bacon, Florida, Florida Gator, Gainesville, Gators, School of Veterinary Medicine, The New Barker dog magazine., University of Florida, University of Florida College of Veterinary Medicine, Veterinary Medicine3 Comments on Because of You.